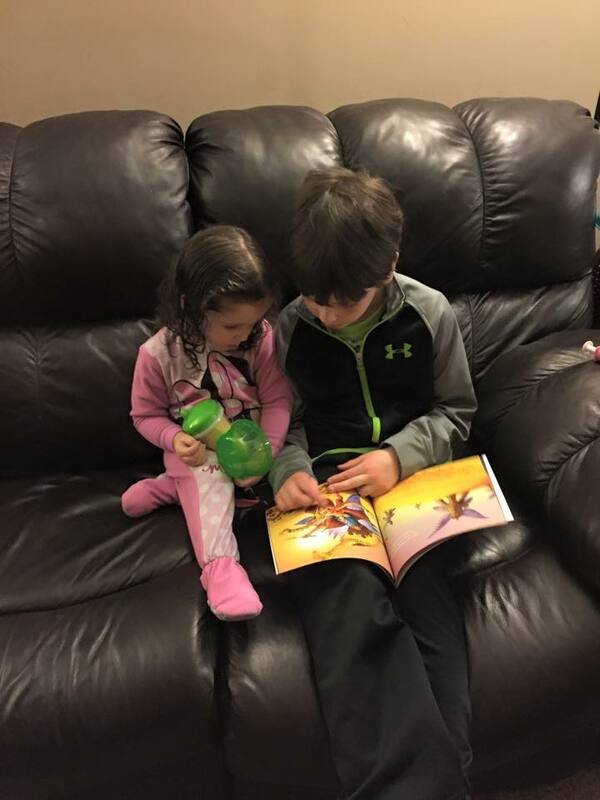 Big brother reading to his sister – the reason for writing this book: Encourage Reading! Nothing is more magical to me than the sound of a child reading a book. Well, except maybe the sound of a book being read to a child! The main reason I felt driven to write children’s books was to add to the magically enticing library of stories already appealing and available. I want to help fill the world with magical books! Or at least children’s homes –with positive, encouraging books that make them eager to explore the worlds that reading introduces. I want kids all around the globe to have an opportunity to see the possibilities that are in store for them when they learn to read and then enjoy reading. Children who own their own books, or have books in their home are not only more likely to enjoy reading but they also go further in school. A few studies in 2010*, one conducted over twenty years, have shown that as few as 20 books in a child’s home enables the child to obtain a higher education degree than children who do not own any books. Having books in the home was a greater indicator of success in school than having highly educated parents. Owning books encourages children to read more and to like reading more, leading them to have a better attitude toward learning. Having books at home also encourages adults to read aloud, and help nurture that love of the reading experience. I used to love to read to my kids! I remember, even after a hard day working both at home and as a lawyer, never being too tired to read at least for 10 minutes. Cuddling over a book and reading together was the best part of the day. I wanted to pass that love of reading along to my children. And you can do this too. Reading aloud to kids helps them read beyond their ability, and challenges them to expand their vocabulary, enticing them to books at higher reading levels. If you don’t have any kids around, volunteer this summer at your local library’s summer reading program. I had so much fun in Yonkers, NY last year helping young readers master and enjoy reading. Sometimes it is the child that struggles with reading that needs to be inspired by you reading aloud an interesting story that is just a bit too difficult for them to tackle, but even proficient readers enjoy hearing a tale read aloud while they read along with you. Find a book you cherished as a child and read it to a child, or send it home with a colleague who has children, or donate it to a local daycare. And post your reading experience here on IndexCardCure™. Let’s strengthen the magical potential generated through spreading a love of reading!